I am one of “those people” who likes to take down the Christmas decor immediately following the 25th. After Christmas Day, any remaining holiday decor is simply a reminder of something I haven’t yet accomplished on my to-do list. 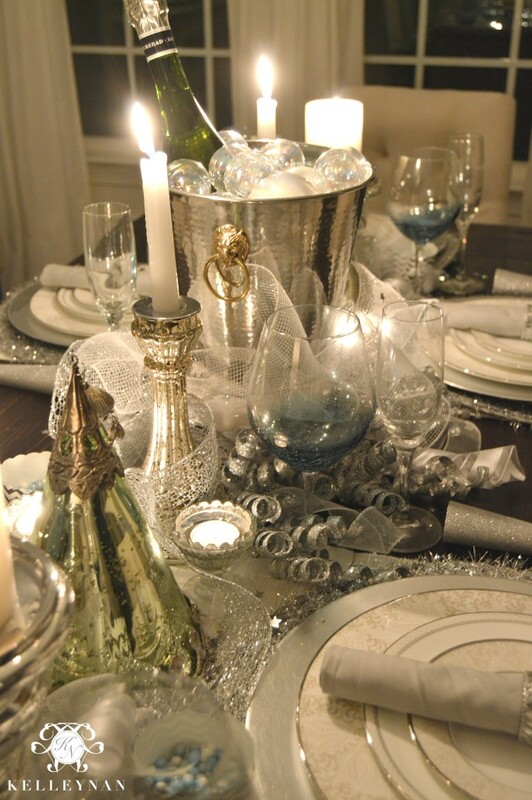 So, this weekend, I multi-tasked packing, shopping after-Christmas sales, and planning my New Year’s table. 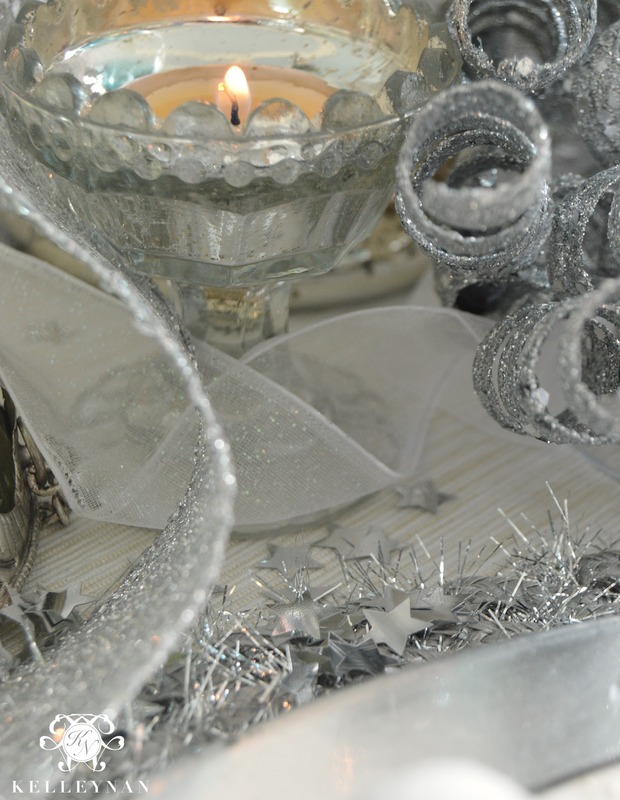 Creating this table as I was disassembling Christmas actually made it easier as I knew I wanted to use some of my silver, whimsical accessories. I set out to create an easy table, utilizing much of what I already owned. 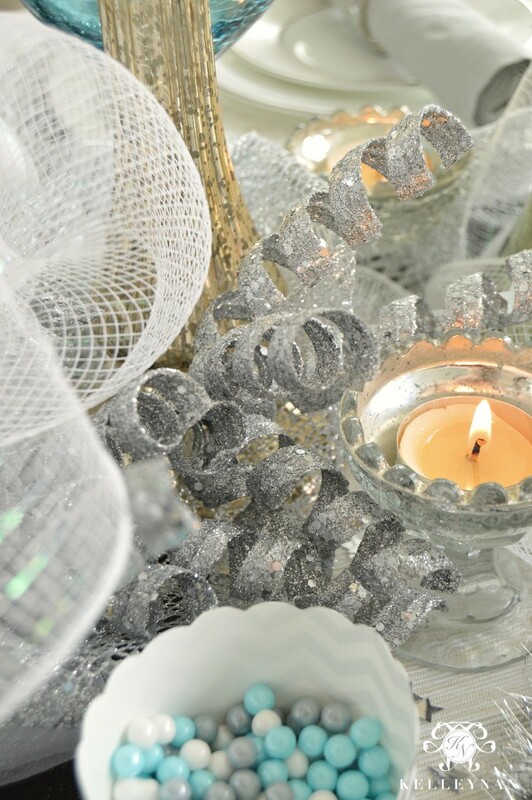 With the hectic Christmas to New Year’s transition, I didn’t have the time or energy to plan something too time consuming. I decided to use silver and blue, a typical New Year’s color scheme (and two colors in which I already have a good bit). I cannot take credit for the idea behind my centerpiece. When I was talking to my mother (as I often do in planning spaces), she said she envisioned champagne with ornaments as bubbles. 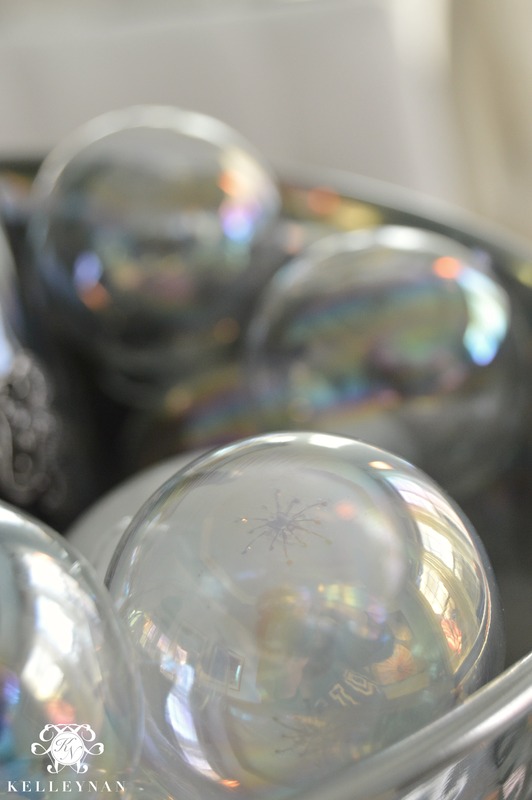 I have to admit, I wasn’t completely sold as I thought it may be a bit of a stretch to use any ball ornaments I owned as “bubbles”. When I ran into Michaels to scour the near barren, leftover Christmas aisles, I came across a pack of small iridescent ornaments for 70% off. 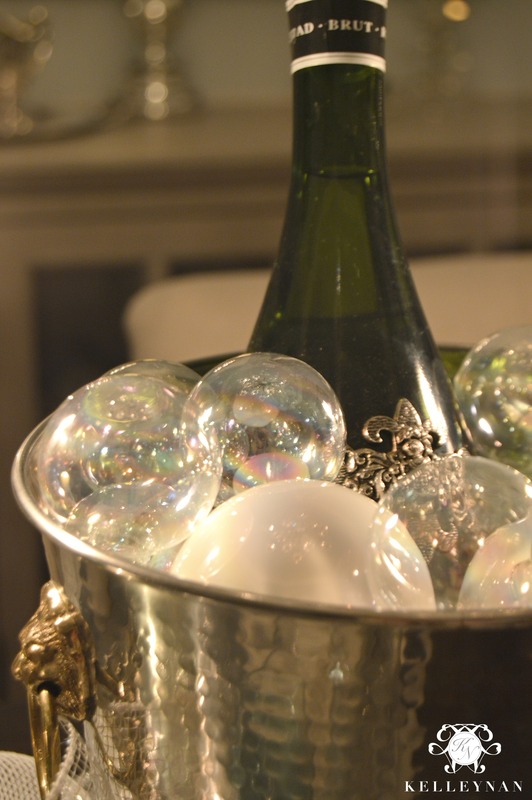 The perfect champagne bubbles, just as my mother had described. I removed the hook from each and used a couple of larger white ornaments for filler. While I have other buckets I could have used, HomeGoods had this hammered champagne chiller on clearance for $10. I found it during the same outing as when I discovered the “champagne bubbles”, so it was obviously meant to be. 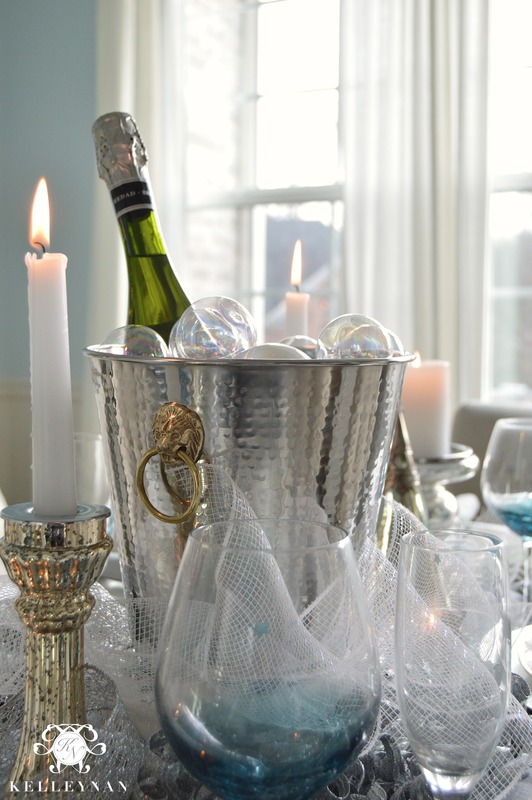 I used a hand towel in the bottom to prop up the champagne and bubbles a bit. I didn’t want to include actual party hats on my table as I was worried they would give too much of a “Party City birthday” vibe. But, when I spotted these (ok, honestly, I’m not entirely sure what they are, but I think they are lanterns of some sort), I thought they looked exactly like a fancy party hat. On holiday clearance at HomeGoods for 50% off, I grabbed them up. 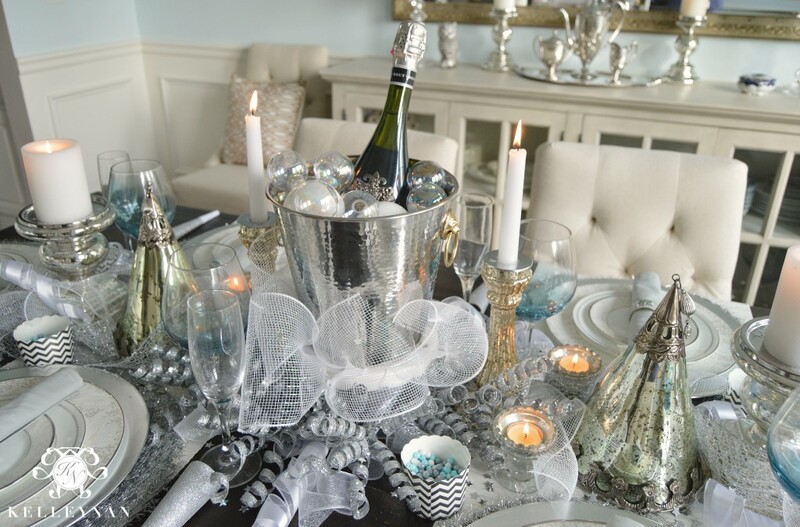 With my champagne bucket and “party hats” as the main elements of my centerpiece, it was easy to fill in the rest. 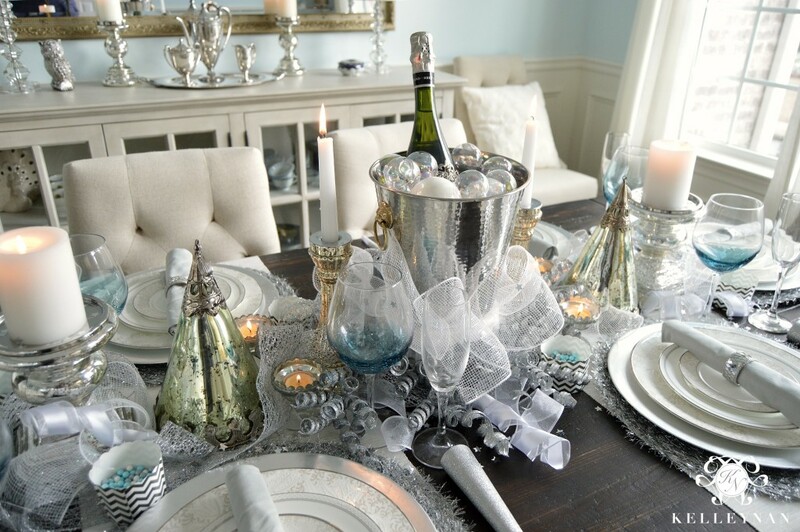 I had cut ribbon from Christmas gifts we had torn into the day before that I couldn’t bare to part with, and a few pieces of mesh from my tree; I cut them and wove them throughout the center of the table. 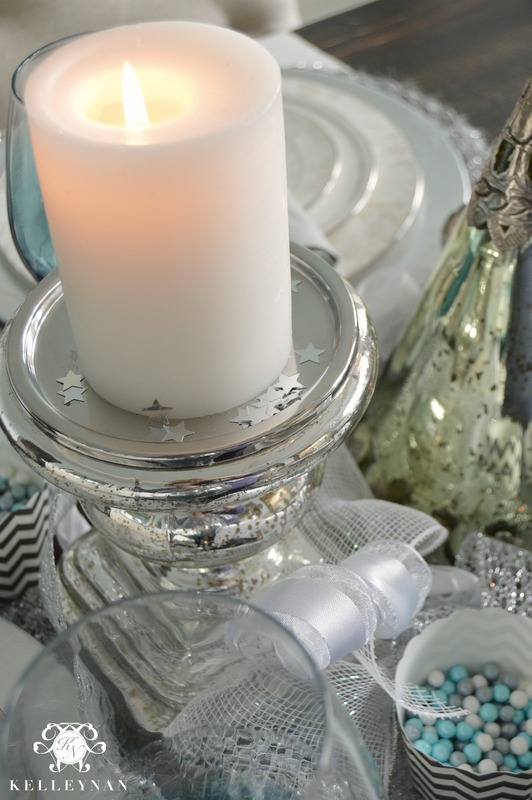 I also used some mercury candle holders, which can be seen in many of my table designs. 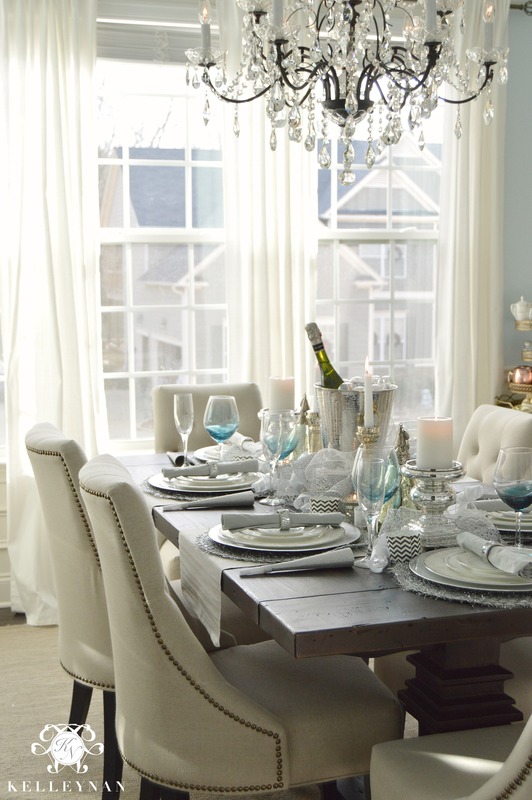 The tapered, votive and pillar candle holders here can be found at Pottery Barn. 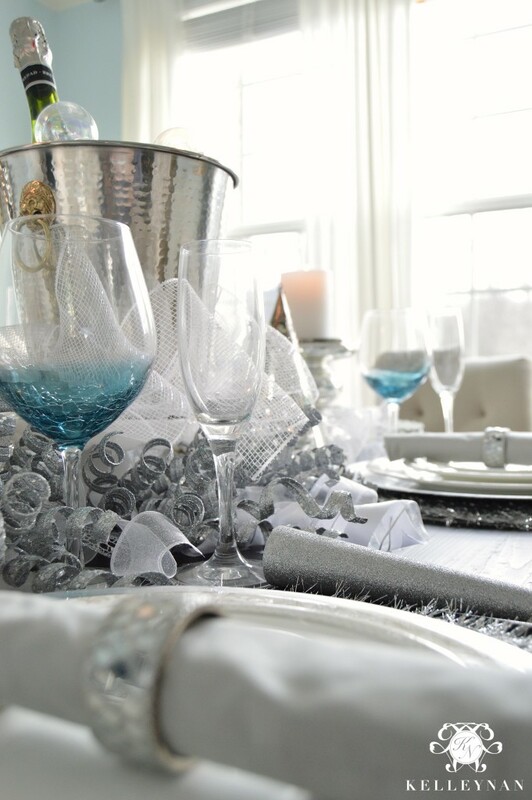 To make the table a little more fun and festive, I added some silver horns to each place setting, along with black and white paper chevron cups I had on hand. 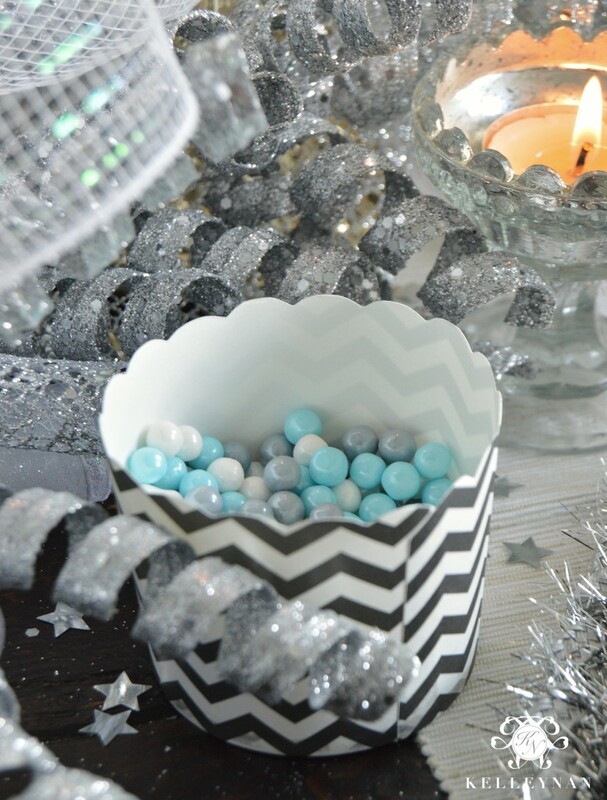 The small candies were also on clearance at HomeGoods for $1. 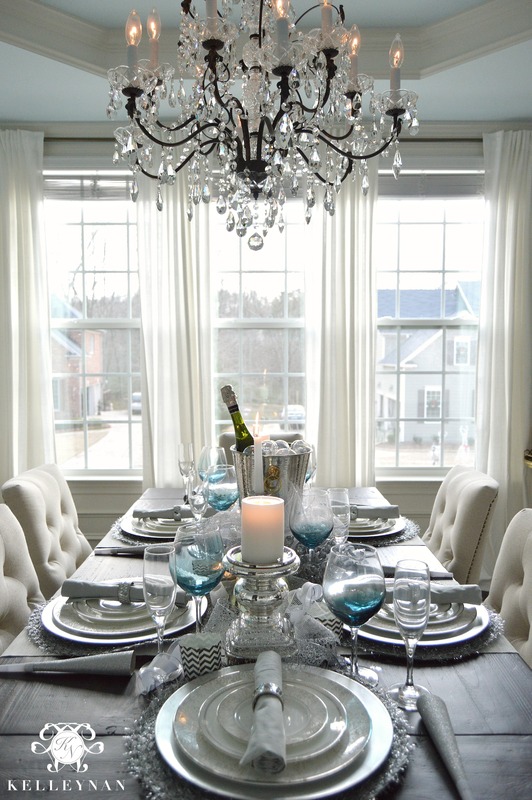 I opted against a tablecloth, but to keep a layered, structured look in the midst of this busy table, I did use two runners I had in my “stock” from Ikea. They are a simple, basic material, but worked perfectly. You can find these super affordable runners HERE. 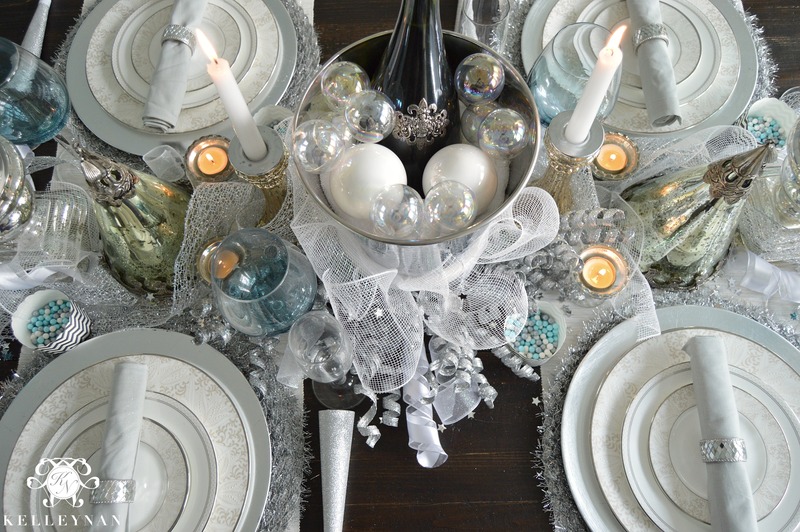 The tinsel place mats were used in my first Christmas tablescape, as shown in my Christmas Home Tour, I picked up these silver chargers on clearance at Target for about $1, and then I used my fine china which I love using in many of the tables I create. 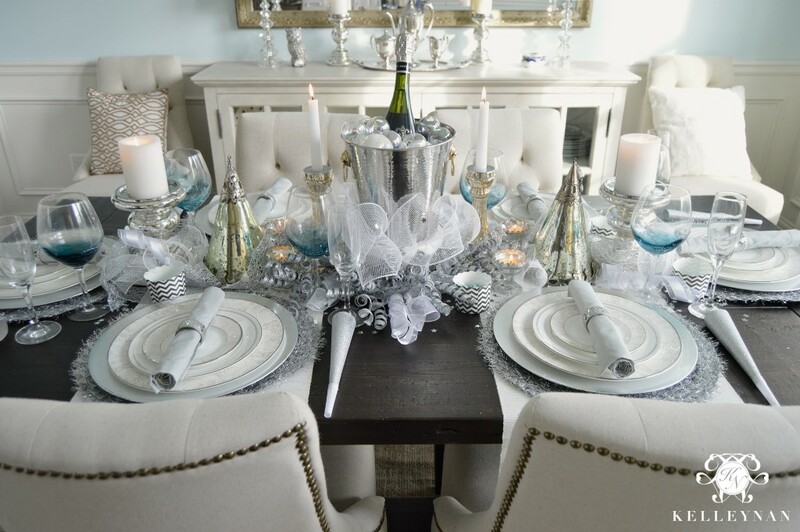 You can check out the Waterford Padova collection HERE and the Waterford Bassano collection HERE. 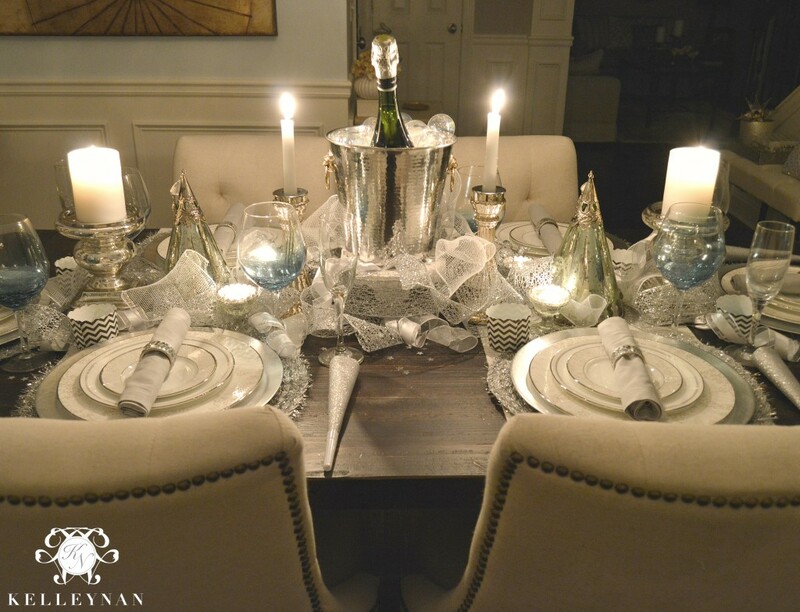 The napkins were purchased on sale at Williams Sonoma (details also in the Christmas tour) and the mirrored napkin rings were last seen on my Copper Christmas Table from Bed Bath & Beyond. I did use a small pedestal from the Dollar Spot at target to give the bucket a little height. The mesh, ribbon and tulle cover it pretty well. 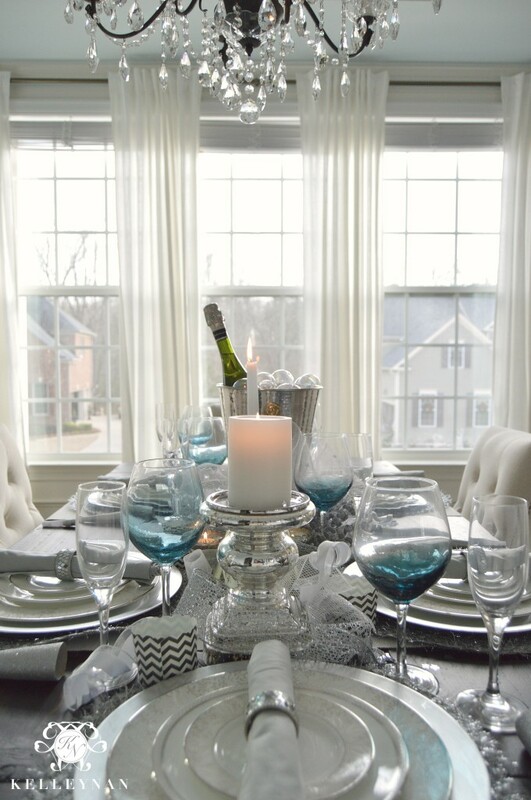 My wine glasses were purchased at Pier 1 about a year ago; these are the same wine goblets I use on our everyday peacock table. I have a couple of colors of the crackle glasses; you can find those HERE. 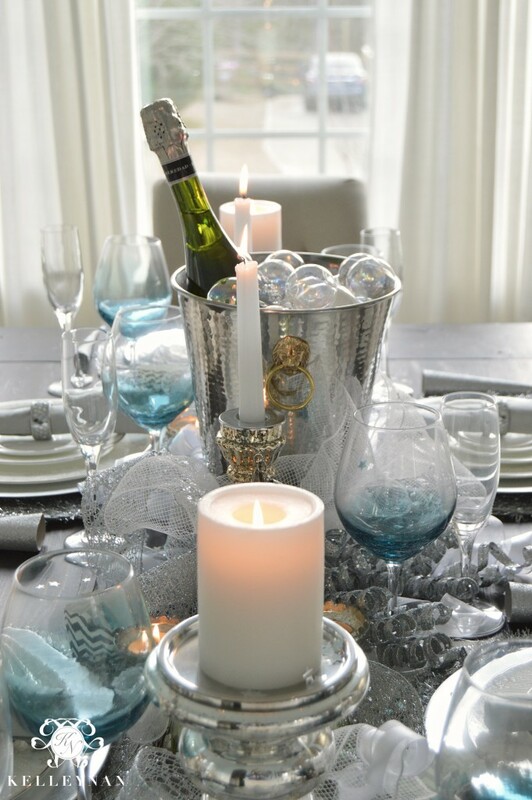 While a have a few nice pairs of champagne flutes, they are too fragile to be placed on a table and are only used for special occasions between my husband and I. I love using these that my mom picked up at a yard sale a while ago for this occasion. Just for fun, I thought I would share a few night shots since it is a more accurate time in which this table will be used. I love the shimmer of the iridescent “bubbles” here. 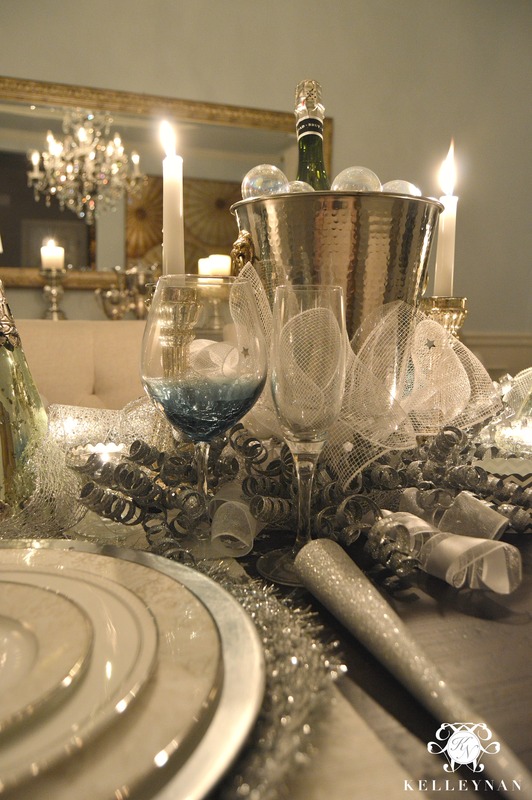 If you have not taken down your Christmas decor, I hope this can inspire you to use some of that holiday magic you already have displayed to create an easy New Year’s Even table.Wishing you all wonderful days as 2015 comes to a close and a very happy new year! One word. WOW! Oh, and your Mom was right! Thank you so very much! She always is haha- thank you for taking the time to stop by- wishing you a wonderful and happy New Year! Just gorgeous, Kelley! Beautiful shots! And your mom’s idea was perfection! Kudos, Mom! 🙂 Happy New Year!! As always, everything is absolutely gorgeous even the candy display. 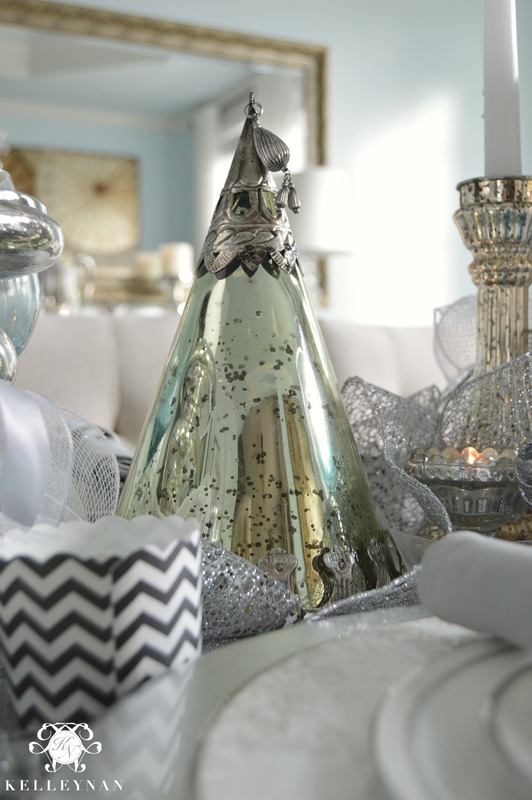 Have a wonderful rest of 2015 and an even better New Year. Looking forward to what you will share. Gloria thank you for stopping by and your kind words! Wishing you a wonderful New Year! 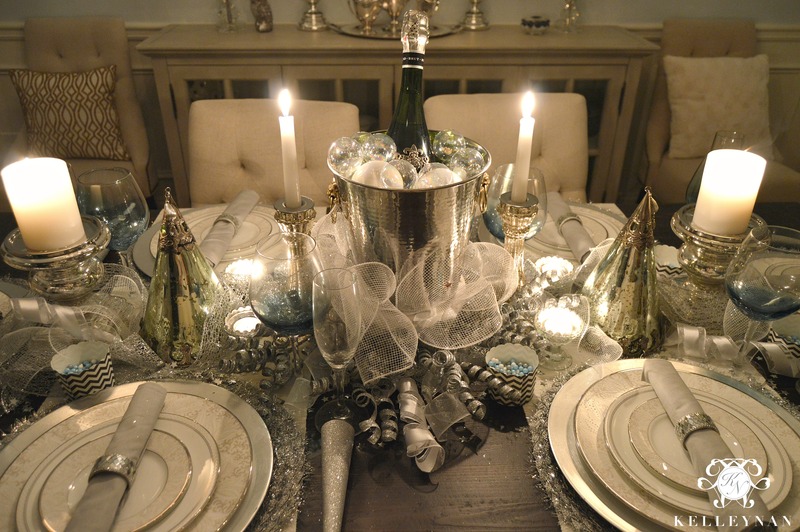 What a fabulous New Year’s table, I love the champagne bubbles, such a clever idea! I love your home and can’t stop looking at your beautiful pictures. Thank you for sharing. The bubbly and balls 😉 are so perfect!!! Happy New Years my oh so talented friend! 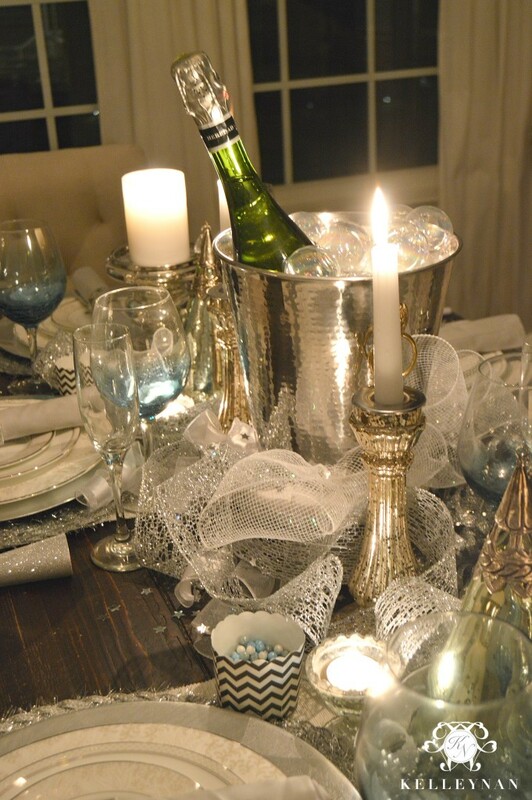 My New Years eve table will likely be much the same as my Christmas table, there’s only so many tables I can decorate! 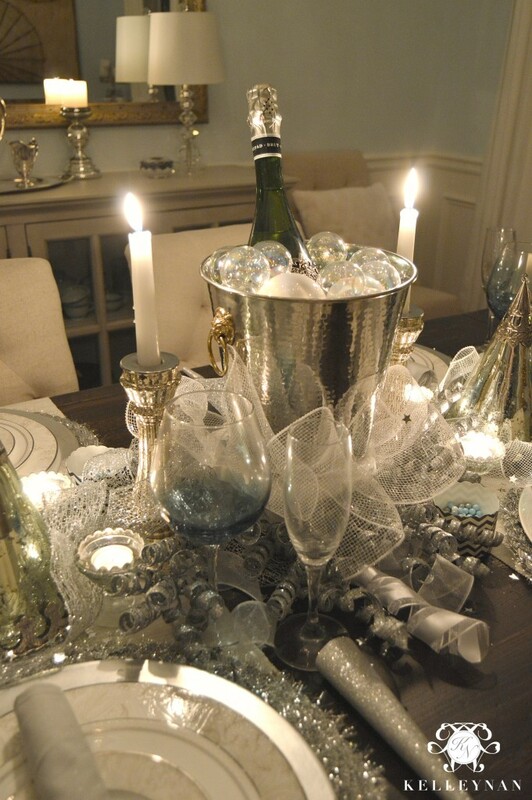 I finally just read this and I’m in LOVE with that centrepiece! Mom was right!! 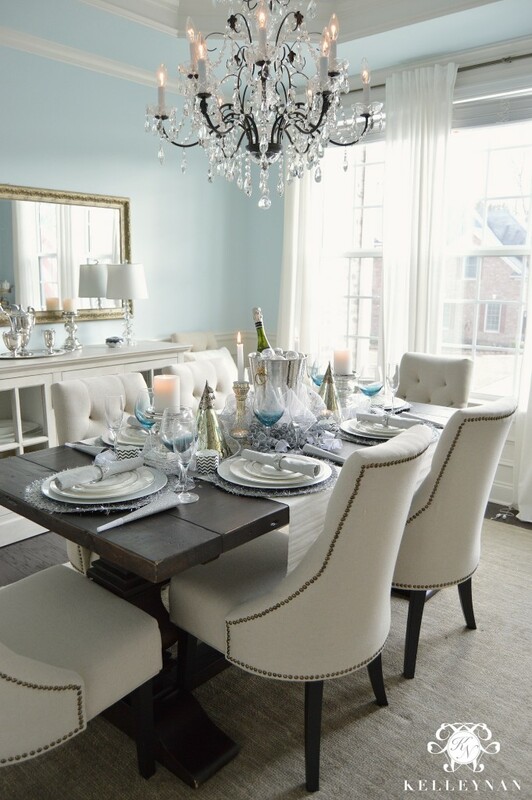 All the details are brilliant and I love the blue with your walls! How I wish incould celebrate the New Year with you, my friend!! Wishing you nothing but the very best for 2016!! Tam, thank you for your support and I would love nothing more! Who knows, maybe we will be ringing in 2017 together 😉 Here’s to a new year, my friend! Absolutely stunning! Sure wish I lived next door so I could join you! The bubbles are my favorite! I just LOVE looking at your page and all the beautiful creations you come up with!! Everything is always so gorgeous. You have a true talent!! 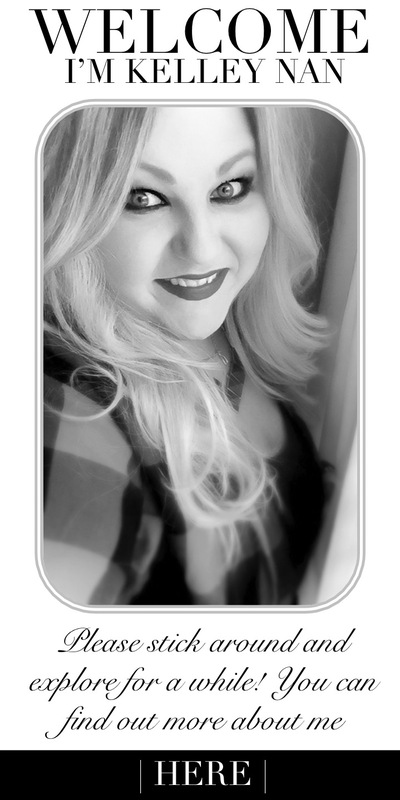 <3 Hope you have a fantastic New Year!!!! Megan, thank you so so much and thank you for stopping by! 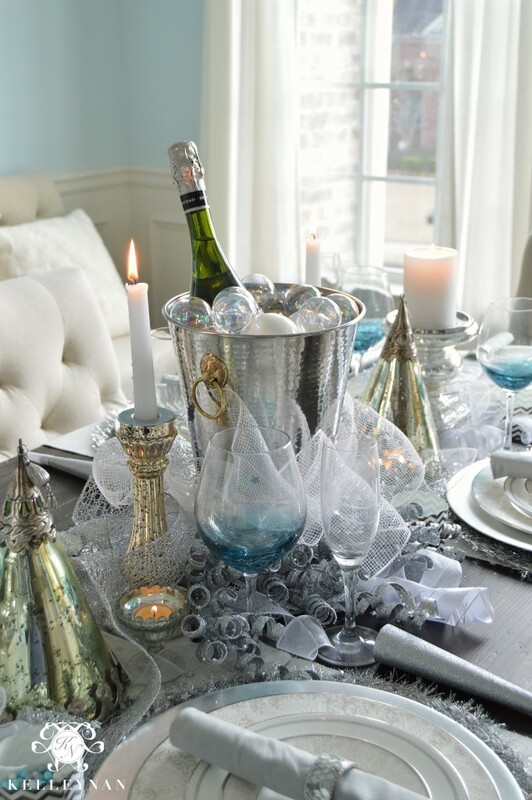 Wishing you a fabulous New Year! I can’t even with the bubbles!!! Great going mom! 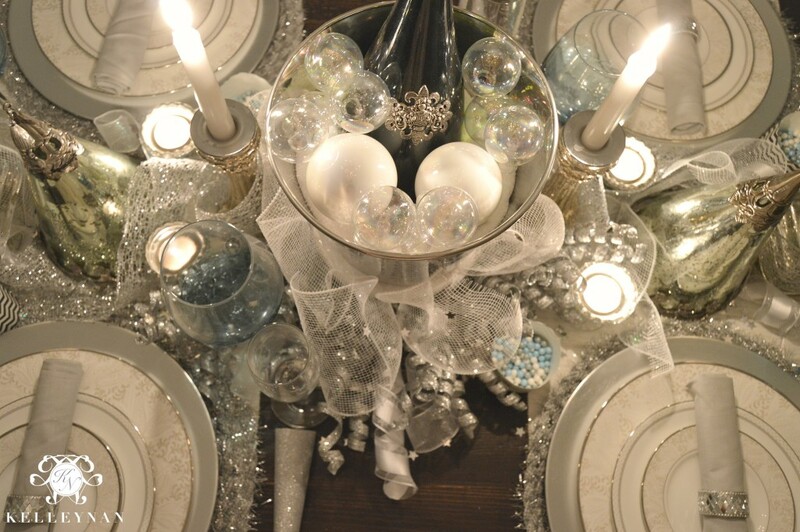 What a beautiful table, Kel! Happy New Year! She is always right! Haha- Happy New Year, K! 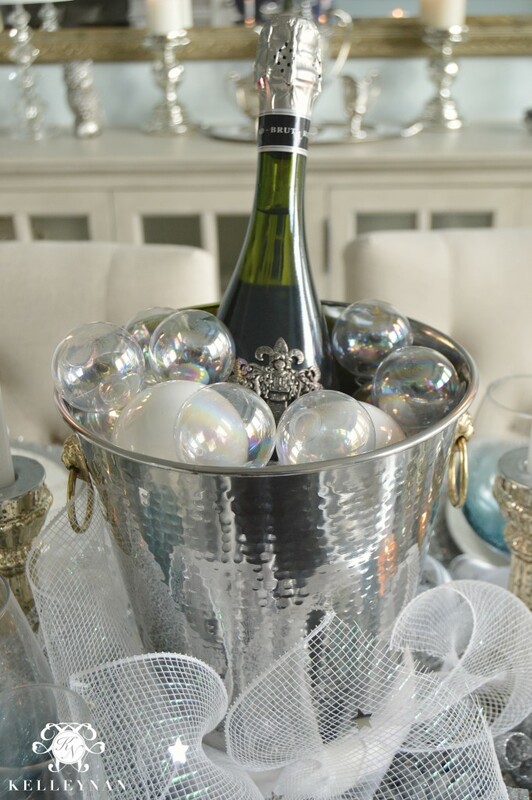 Tell your mom I’m totally doing the champagne bucket with the bubbles! LOVE IT!!! Found your IG during my holiday break and I’m loving ever post. Blessing for the New Year! Love that!! I know, now I want to add bubbles to everything! Haha. Thank you so very much for visiting with me! 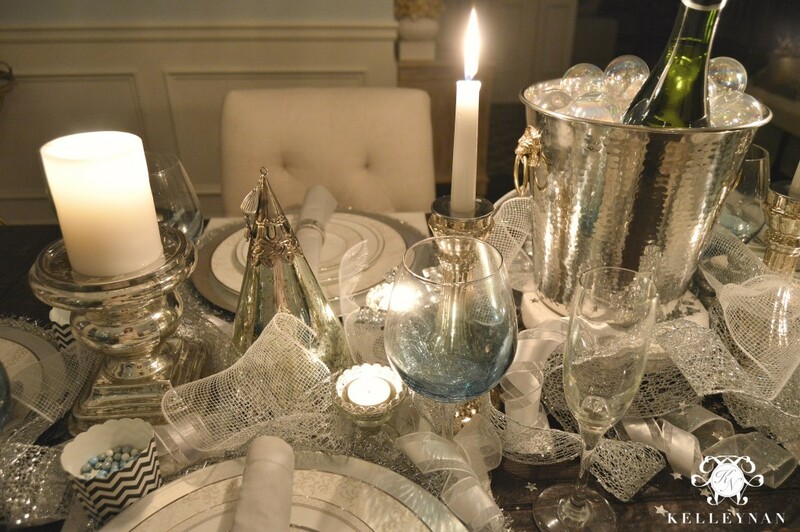 That mesh centerpiece is so pretty. Where did you find it? It’s absolutely beautiful all lit up! Hope you had a great night! Happy New Year! Bree, thank you. It means so much that you stopped by for a visit, my friend! Happy New Year! I sure do love this. Happy New Year and see you soon!